← Who’s Singin’ the Cabin Fever Blues? Calm, peaceful Main Street in Yale, MI, in 2009. My dad sits on that bench waiting for me with a cappuccino. Last Tuesday morning, just before Barry and I drove to Marquette for a lovely pre-Valentines Day weekend getaway, my mom emailed. 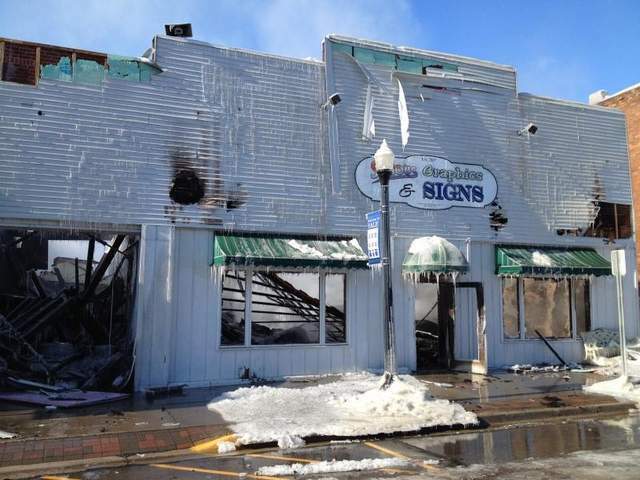 The Dodge Garage building, owned by my mother, in my hometown of Yale in the Thumb of Michigan, was burning. By the grace of God and maybe twenty-one fire departments, this proved to be the only building to burn beyond recognition on Yale’s Main Street on this cold winter day last week. What else could have burned to the ground, to no longer exist except in memory? The Wash House, next door, owned by my brother, Scot, could have incinerated. Although it’s been badly damaged on one wall, I suspect (and insurance willing) that someday folks will once again wash and dry clothes in the laundromat. The Yale Expositor, our dear weekly newspaper, could have disappeared from its old building. It could be no more. The owners (one of whom I babysat years and years ago in another lifetime) worked ceaselessly to save historical books and microfilm. 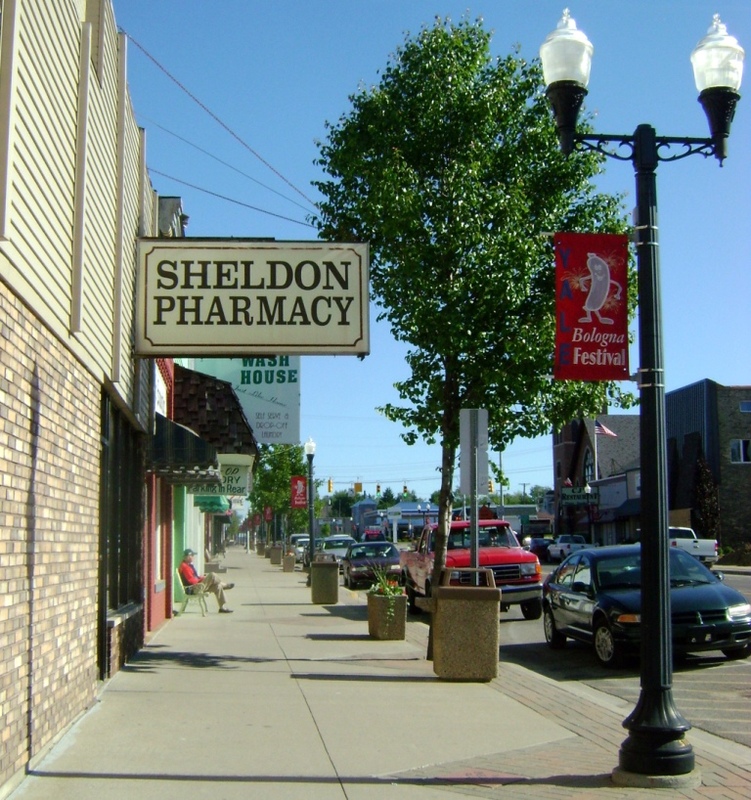 And further down the street, right at the corner, our family’s pharmacy still stands strong. Owned now by my brother, Scot, it still survives to fill prescriptions for those in pain, in ill-health, in need of medication. It still survives as a place where one can buy greeting cards, or Ladies Home Journal, or a gift for Grandma’s birthday. Other buildings, on the other side of the Dodge Garage, could have ignited, just like that, never to be seen again, never to be visited, shopped, enjoyed. Even better than the survival of all these old buildings is that no one was injured or killed in that massive blaze that brought tears to the faces of many. Thank goodness. No lives were lost. Main Street, Yale, last Tuesday morning. Photo taken by my nephew, Lee. I have a fist-full of memories of the Dodge Garage to share with you. When my parents first moved to Yale in the 1960’s, a Dodge dealership lodged in the building. Sometime along the line, my dad bought it. What I remember is that Dad carried excess stock from the Pharmacy and the Discount Store, another store he owned further down the block, and my job involved selling the extra paper towel, candy, notebooks, toothpaste and whatever at the Dodge Garage. Even though I was a shy teenager, working at the Pharmacy and Discount Store and the Dodge Garage ignited a love of people. I liked the community members who visited regularly, who chatted, who smiled, who said please and thank you as you waited on them. Later, in the 1990’s, our kids worked at the Dodge Garage when they visited Nanny and Papa. Christopher recalls it with great fondness. Our daughter sold golf balls gifted to her by her other grandpa who lived on a golf course and earned a very lucrative wage for a seven-year-old. Seven years ago my mom rented the building to a fellow named Matt McNutt who owned a business called “Serious Graphics and Signs”. We’ve heard that the community of Yale joined together to help the fire fighters, to support the City Hall, to give of their time and effort. My friend, Christie, who lives in East Lansing, messaged during the fire to say that part of her wished she could return to Yale to do something–anything–to help. I felt the same way. But Yale is 550 long miles from the Upper Peninsula where we live. This entry was posted in February 2014 and tagged Dodge Garage, family, life, memories, Sheldon Pharmacy, thoughts, Yale, Yale Michigan fire. Bookmark the permalink. As you said, the merciful thing is that no lives were lost, no injuries dealt out, no other historic buildings or businesses were lost. There is sadness, certainly, but not grief. Wow, so sorry to hear about the fire, but glad to know things weren’t worse. Thanks for sharing your memoires of these old buildings. Blessings to the folks who fought the flames. Thank God, no one was hurt, I am so sorry for your loss. I am a “Bay City” girl, so I know where you write of. I will miss it on my next trip through, and think of your wonderful words that are written here. You have lots of special memories! Ohhh, so sorry to hear about this. What a lovely tribute from you today through a scary event. Such wonderful memories — and family history. And what a terrific band of fire departments and community members, too. So sorry to hear of your family’s, yours and Yales’ loss. I am glad that no lives were lost, and no other buildings. A loss like this always seems harder on small towns, but folks will draw together to support each other. You have wonderful memories, and no fire can destroy them. Oh, I’m so sorry! I can imagine how this hurt on so many levels, while you felt relief that no lives were lost. I recently watched news come in from a large fire in downtown Lapeer, on the block where the old Pix theater still stands. So many memories! Two of my grand-nephews were displaced when their apartment building succumbed to the blaze, but no one was hurt there, either. In every tragedy, there are things to be thankful for, is perhaps the lesson. My sympathies are also extended to all of your family, who share in this loss with you. So sorry that this piece of your past is gone – but luckily, not from your memory. What a tragedy to lose this much history, however what a blessing no one was hurt. Yale sounds like a lovely place to have grown up in and to go back to visit. Memories are like sparkling stones in a shallow stream; always so near the surface. It’s a rather sad turn of events, but at least no one was hurt. I am so sorry to hear of the tragic loss of a beloved piece of your past. Will your Mom want to rebuild? We had such a fire here in the small town of Lexington, VA where a much loved restaurant on Main Street (the Southern Inn) burned and most of the Hallmark store next to it. Both were rebuilt. It took over a year but they are back in business. Thank the Lord that no other building burned. I’m sure anyone that has a connection to that building is sad but it is also good that there was not loss of life. Kathy! Wow! So much history. Family history. Community history. Thankfully no one got hurt. And nothing transforms like fire. This too may just turn out a blessing in disguise. Sending Love. I’m sorry Kathy. Still a shocking loss.for your family. I’m so sorry for the pain of this loss to you and your family and for your home town. This is terrible! 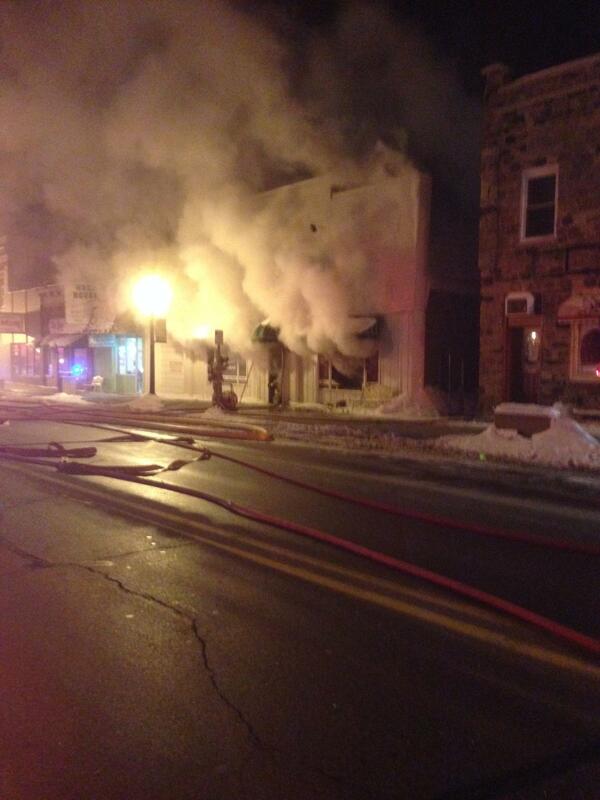 Fire is so scary anyway, and for it to be a building in downtown with so many memories…just really sad. I’m so sorry! It is such a shame that an unfortunate event like that fire was necessary for such sweet memories to be recorded and passed on to us. Your family is certainly a chapter in the history book of Yale. How sad. Your story was so vivid that I can picture the scrambling going on in the other buildings during the fire. Loss such as this, even with no humans hurt physically is still a loss to hearts. Here is wishing safe recovery in that area. Oh my gosh! Thank God no one was hurt from this fire! I’m sorry about the loss of the building that held so many memories for you and your family, Kathy. This tragedy shows us how to keep our memories alive. I hope everyone can recover from this loss and hold memories close in their hearts. Wow – more than 15 fire departments were at the scene! So sorry to hear about this, Kathy, but very relieved to know that no lives were lost. Fires are so frightening and remind us of how precarious our lives and plans are. I enjoyed reading your reminisces about the role these buildings played in your childhood. What a wonderful sense of community Yale seems to have. It is sad when items that spur so many memories for people are destroyed. Glad to hear no one was hurt … after the mourning, it will be life giving to create a new building that will provide future generations great memories like the old building did for you. So sorry to hear about the fire…thank goodness no one was hurt. Kathy – I am so grateful that no lives were lost, and that the damage didn’t spread any further than it did. I’ve come to believe that endings mean something else is about to begin. Oh how sad. Even an outsider can go into a small town and feel the history in the buildings. For an insider, this would be so poignant. I always feel a pang of sadness when these old buildings go. So much history and so many memories. But also feel much like Laurie, that endings are also beginnings. And I do love the memories you share here Kathy and the sense of community that is obviously still very strong in Yale. A reminder that each building has a wealth of stories behind its facade. You have some good and lasting memories. I had the pleasure of growing up across the street from the Dodge Garage in the 1950s. We moved away in 1960, but Yale still feels like home. That is so sad! I’m sorry to hear that Kathy….but so glad that no one was injured (or worse) and that no other buildings were too badly damaged. Oh my God! Kathy, how did it all happen? thankfully everyone is safe.. this is really frightening, Too much damage? be careful, please. Even though it was just a building, I know how hard losing one can me. One morning when I was in the 5th grade, a big barn burned on our farm. One of the men who worked with my dad at the time managed to save some of the livestock, but the barn housed a large hayloft, so there wasn’t much hope. Still, like in Yale, the community pulled together and were supportive of my parents. Guess we’ll take blessings where we find them. That sounds so traumatic. I’m glad everyone pulled together and no lives were lost. Please contact me. I have been in Yale for over 20 years and am doing some research on Dodge. I will be talking to Barb @ the Expositor as well.